The character of Sherlock Holmes influenced countless branches of art, science and even everyday life. In the following we would like to reveal the connection between the master detective and the movement of scouting. 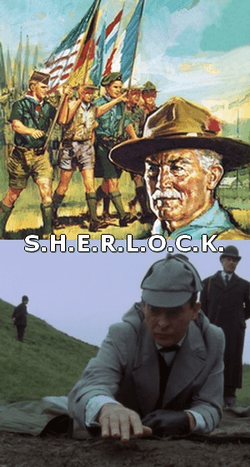 Both the stories of Sherlock Holmes and the Scouting Movement were created by British men who were eager to do something for humanity (Sir Arthur Conan Doyle and Colonel Robert Stephenson Smyth Baden-Powell). The two initiatives became acclaimed worldwide and have countless groups of fans and followers, and they make the life of many people happy even these days. The great detective treated everyone equally, he did not care whether someone was rich or poor. In scouting there are no social differences, everyone looks the same in the uniform. For Holmes the deeds of people were important, and scouts could gain their merits through benefactions. 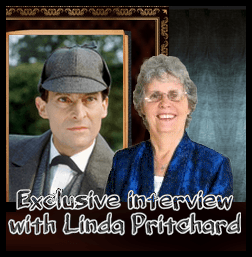 Sherlock dared to take responsibility for his actions – there was great emphasis on the answerability of the scouts as well. The sleuth knew and it was a firm belief of his that while he fulfills his task, he works for the benefit of the whole society. To achieve it, and to have an excellent performance, he systematically improved his mental and physical abilities. The fundamental aim of the Scouting Movement was to support young people in developing their physical, spiritual, social and mental skills. They could do this as individuals, as liable citizens or as members of local, national and international communities. 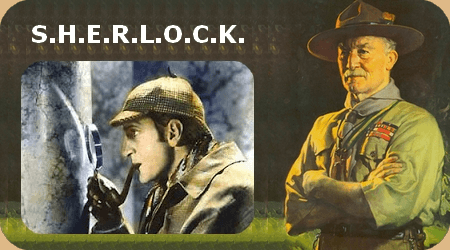 Sherlock strongly believed that he can solve all problems he faces and he can adapt to the occurrences of life – scouts were of this opinion too. The world of children was not very alien from Holmes. He employed the Baker Street Irregulars to help him solve some of his cases. Through this cooperation these young people had tasks with they could not only occupy themselves, but they observed the behaviour of people, and, above all, they earned some money and won the feeling of success. Scouts experienced the same feelings when they sold cookies. While working, wastrels of Baker Street and young people who entered the movement broadened their knowledge, they became more persistent and had more self-confidence, so they could live in the world with the feeling that they are in greater safety. Not only Baden-Powell loved nature, but Arthur Conan Doyle and the two renowned doctors, Joseph Bell and Oliver Wendell Holmes as well, who were the models of Sherlock Holmes. In the adventures it is mentioned several times that while investigating in the country, Holmes makes the best of his time, escaping from the crowdy and grey London. Sherlock especially loves flowers and birds, and he was a super clue hunter. The figure of Holmes and the Scouting Movement both had affected positively many aspects of life, it is enough to mention culture and economy. Products related to them can be found among books, souvenirs and artworks. All the good things they represent live on in every people who are touched by the adventures of Sherlock or who find a new home and friends in the huge family of scouts. A further similarity is that positive feelings can be associated with both. The Scouting Movement offers togetherness, good-fellowship and success gained together. One of the biggest virtues of Holmes is that he is the symbol of hope, and hope is very important in life. When someone has hope, that man or woman is able to have confidence in someone or in something, which gives him/her strength even under very bad circumstances. Nowadays, when people always hurry and they become more and more estranged from each other, there is a great need of those good things that the sleuth and the scouts represent. Sherlock Holmes and his methods even became part of the training of scouts. Let’s see how did this happen. The Scouting Movement was founded in 1907 in Great Britain. The chief scout of the British army was Colonel Robert Stephenson Smyth Baden-Powell (1857-1941). He served in the army from 1876 till 1910 and received the Order of Merit among other awards. Two of his most well-known books are Aids to Scouting for NCOs and Men (1899), which is an army manual, and Scouting for Boys (1908). The latter marked the beginning of the official Boy Scout movement in England. This was the adaptation of Aids… to make it more suitable for boys who wanted to be scouts. Baden-Powell believed that the „art” of detection, observation and deduction can be learned. That is why he recommended for his students (both children and adults) to read the Sherlock Holmes stories of Arthur Conan Doyle, as a kind of introduction to the processes and later as a way of practicing what had been learnt. For scouts Sherlock was kind of a role model. Tracking is very important both in the army and in scouting. As the Colonel recalled in his autobiography (Lessons from the Varsity of Life, 1933), his generation had this ability but they made very little use of it, so it was rather neglected. Sherlock Holmes has a peculiar ability: he collects clues, analyses and deduces them, and finally he solves the most controversial cases. Similarly, scouts have to use specific abilities for being able to save lives and find their way about in the woods. This skill was called „ Sherlock Holmes-ism ” or „ Sherlocking ”. The reason for that is simple. The technique consists of eight words, and it is made up from the letters of the name „Sherlock”. In other words, it is a list of things one has to do in order to be prepared as the great detective. S. H. E. R. L. O. C. K.
See: see and use all your senses at the same time. Hear: listen carefully and keep the tiny details in mind. The Colonel said: " If you make listening and observation your occupation you will gain much more than you can by talk. " Examine: test everything – objects, circumstances, persons, etc. Read and Learn: these two are the most important points on the list. As we know from the example of Holmes, real learning comes from reading a lot. If you read about different topics, you broaden your knowledge. Observe: noticing things alone is not enough, you have to remember the details – they can be important later. Good memory is necessary for being good at observing things, so train yours. Conclude: it is similar to deduce. You observe the details, and base an opinion on them. It is crucial to have faith in yourself – only this way will you be able to collect the pieces of information and clues and deduce them. For deducing you will need imagination and intuition. Know: all what you believe of the case, based on the seven points above, may be true or false. Everybody makes mistakes, but going back to the details in question may offer new possibilities. You can learn from the mistakes you make. It can also be helpful to share your findings with others.